When I give a genre talk about science fiction to my students, my main claim is that all good science fiction, no matter how apparently “alien” (literally and figuratively), is actually saying something important about the world in which we live (or at least the world that existed when the work first appeared). Not necessarily in an allegorical way, but in a way that makes the narrative more than just a story. With Joshua Bellin’s Freefall, I now have another title to share as evidence for this claim. Bellin's young adult science fiction novel begins with Cam waking up from "deepsleep" on a distant planet, confused, alone, and frightened. This is not where he was supposed to wake up, not how the colonization of a new planet was supposed to begin. This is not why he endured a thousand-year induced coma, and this is not why he and the other Upperworlders fled a dying Earth. Flash back a thousand years, as Bellin's novel does in alternating chapters throughout most of the book, and we discover Cam becoming "woke." A young man waking up to the costs of his privilege, a young man learning to question a world where a minority control nearly all of the wealth and power. A young man who learns some truths about the Lowerworld and about himself, truths tied to his growing devotion and love for a beautiful and mysterious Lowerworld leader named Sofie. Sofie and her movement want justice for those born in the Lowerworld, a justice denied them by the social stratification the Upperworlders have used to plunder Earth until the planet can no longer sustain human life. Now Sofie and her movement want representation among those privileged enough to be able to flee to a new world and a new life. Cam, raised by Upperworld society and media to believe those in the Lowerworld deserve their fate, rebels against this worldview as the race intensifies to find a world worth viewing. Bellin leaves plenty of truths for the reader and Cam to discover in the intense action of the final section, as Cam struggles to survive on "Otherworld," truths that reveal the sacrifices necessary for justice. 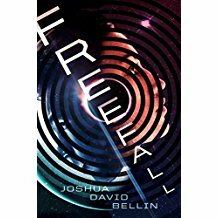 With clear and disturbing parallels to our current political and environmental realities, Freefall uses the darkness of space to do what all good science fiction should: shine a light on what it means to be human.